Humboldt Gymnasium, Bad Pyrmont, Germany. For the last ten years I have been in charge of school football at our school, the Humboldt-Gymnasium Bad Pyrmont. This has led to our involvement in a multitude of competitions, events and projects, as well as many new friendships and valuable contacts to organizations and other schools. Mathias Bellinghausen, formerly of the German Sports University at Cologne, is one of these contacts – and we were very excited when he asked if we wanted to get involved in a new international project revolving around the 1914 “Christmas Truce” as a jumping-off-point for commemorating the global catastrophe that was World War I, while at the same time celebrating the power of sports to bring people together and overcome differences. 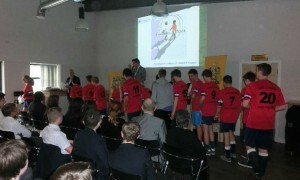 Mathias put us in touch with Ernie Brennan and John Casey of the “Children’s Football Alliance”. Together, we planned a “Football and Peace” project that first of all would allow a group of our students to travel to England and participate in the “Peace Day” celebrations at Maidstone United FC, but would later lead to our involvement in various other, related projects. The aims of the project were and are manifold: The pupils are getting insights into the realities of World War I in general, as well as the “Christmas Truce“ in particular. They are meeting youngsters from many other countries, at first in Britain and later in Belgium, thus forming new friendships and realizing the importance of the European Union and the European idea(l) first hand. In the process they are participating in as well as creating themselves a “culture of remembrance”, which tries to learn from the past and aim for the future. 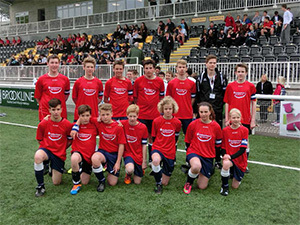 Humboldt Gymnasium receive Football & Peace Medals at the Football & Peace Day Celebration, Maidstone United Football Club’s Gallagher Stadium. 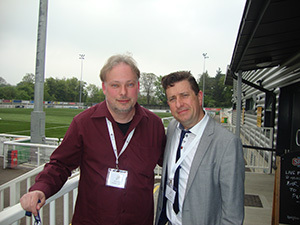 Humboldt Gymnasium, Football & Peace Day Celebration, Maidstone United F.C, Gallagher Stadium. 25th April, 2014. In April we assembled a group of 14 pupils aged 13 and 14 to travel to England for about a week. The main problem here was finding enough sponsors so that we could keep the parents’ contribution at a reasonable level. So at this point I have to express my gratitude to numerous organizations, local banks and businesses in Bad Pyrmont, which financed the bulk of this trip and made a fantastic experience possible: We stayed at a converted school campus near Watford – always accompanied by the great John Casey, whose contributions were absolutely invaluable. The program included many cultural and athletic highlights: a training session with Tottenham Hotspur youth coaches, visiting Wembley Stadium and many other famous sights in London, and most of all the aforementioned “Peace Day“. There approximately 100 British teenagers, as well as our students, came together and spent the morning together – playing rugby, cricket and football, as well as doing boxing. This celebration of sports was “framed” by a speech by the British sports minister, a panel discussion about World War I and a chance for our pupils to present small gifts in the spirit of the “Christmas Truce”, where the soldiers had exchanged presents.